More than half a century after the Holocaust, in countries where Jews make up just a tiny fraction of the population, products of Jewish culture (or what is perceived as Jewish culture) have become very viable components of the popular public domain. But how can there be a visible and growing Jewish presence in Europe, without the significant presence of Jews? Ruth Ellen Gruber explores this phenomenon, traveling through Germany, Poland, the Czech Republic, Austria, Italy, and elsewhere to observe firsthand the many facets of a remarkable trend. Across the continent, Jewish festivals, performances, publications, and study programs abound. Jewish museums have opened by the dozen, and synagogues and Jewish quarters are being restored, often as tourist attractions. In Europe, at the beginning of the twenty-first century, klezmer music concerts, exhibitions, and cafes with Jewish themes are drawing enthusiastic--and often overwhelmingly non-Jewish--crowds. In what ways, Gruber asks, do non-Jews embrace and enact Jewish culture, and for what reasons? For some, the process is a way of filling in communist-era blanks. For others, it is a means of coming to terms with the Nazi legacy or a key to building (or rebuilding) a democratic and tolerant state. Clearly, the phenomenon has as many motivations as manifestations. Gruber investigates the issues surrounding this "virtual Jewish world" in three specific areas: the reclaiming of the built heritage, including synagogues, cemeteries, and former ghettos and Jewish quarters; the representation of Jewish culture through tourism and museums; and the role of klezmer and Yiddish music as typical "Jewish cultural products." 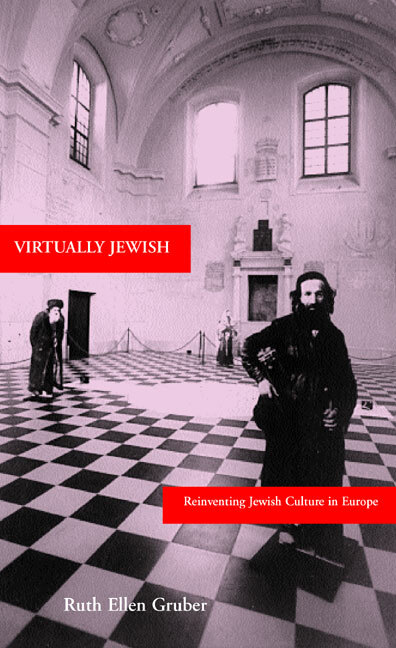 Although she features the relationship of non-Jews to the Jewish phenomenon, Gruber also considers its effect on local Jews and Jewish communities and the revival of Jewish life in Europe. Her view of how the trend has developed and where it may be going is thoughtful, colorful, and very well informed. Ruth Ellen Gruber is the author of Upon the Doorposts of Thy House (1994) and Jewish Heritage Travel (1992/1999). She lives and writes in Italy and Hungary. 3. "There Is No Future without Memory"